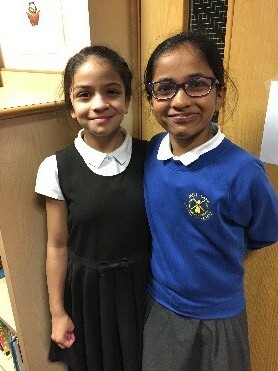 Mill Lane Primary School gained School of Sanctuary status in July 2018. We were extremely proud of this achievement and worked hard to make our school inclusive and welcoming. Our language ambassadors received the award from Mayor Eileen Johnson. You can see our certificate in school. We are committed to ensuring that our students learn and understand what it means to be seeking sanctuary and the difficulties asylum seekers and refugees face. Our curriculum ensures that there are opportunities to learn, understand and take actions around the themes of human rights as well as diversity, inclusion, refuge and migration. Language Ambassadors are actively working on initiatives to enable us to be awarded School of Sanctuary status. Parents are informed of the work surrounding the School of Sanctuary accreditation via our website and through our regular Newsletters. We are also developing ways to engage the wider community which we serve. We have offered support to other schools in Stockton including St Cuthbert’s and Billingham South Primary, as well as schools from Middlesbrough and Hartlepool. All governors and the senior leadership team have had presentations and updates on sanctuary and asylum issues. This has included sharing knowledge of the current world situation of refugees – where people flee from, why they leave and the problems they face. The presentations also included the local situation of our borough of Stockton and why the borough has a relatively large number of people seeking sanctuary. Presentations about the award have been given at staff meetings. PowerPoints and hand-outs covered why people become refugees, where they come from, why some come to Stockton and why they need protection. Resources for all year groups have been shared. Some are general resources from charities including the Red Cross, Amnesty International, BBC film clips which provided the basis for lessons and gave staff more detailed knowledge – facts and figures, case studies and testimonies. Staff actively became involved in our International Refugee Day on June 20th 2017. 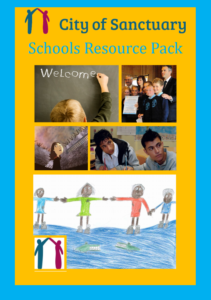 Through our combined Rights Respecting and Values Based PSHcE Curriculum, students learn about why people seek sanctuary (asylum), the traumas they face and the ongoing problems once they arrive in a country of safety. KS2 in particular have learnt about negative stereotypes, challenge myths and learn about why people seek sanctuary, where they come from and why they may arrive in Britain. We have had visits from Refugees who have shared their experiences with KS2 pupils in assemblies. Our EAL loaning library is added to each year, and we are currently in the process of submitting a Bid for a grant to further enhance our Bilingual books. We have displays which reflect the work carried out on school of sanctuary work. 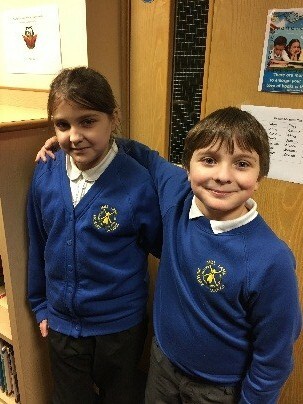 Mill Lane Primary School is extremely proud of the work carried out by its Language Ambassadors. 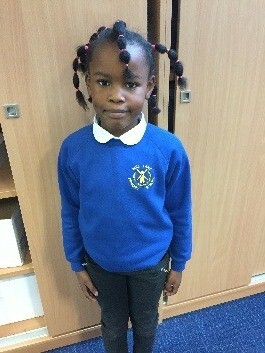 They are a group of bilingual and multilingual children who represent different cultures and languages in our school. Through their supportive network, the language ambassadors promote a love of languages. 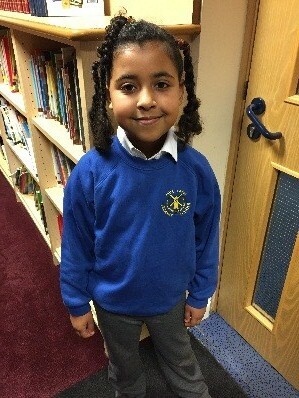 Using their skills and experiences, the children work hard to ensure newly arrived children and families settle into our school. Click here to see our work on International Refugee Day. Find out what is happening in our area on the Tees Valley of Sanctuary website. Justice First http://justicefirst.org.uk/ are a group who support people who are seeking safety in the UK. Refugee Week http://refugeeweek.org.uk/ have information about how to support refugees in the UK and local charity/fundraising projects. The British Red Cross http://www.redcross.org.uk/en/What-we-do/Refugee-support have lots of information about refugee support. 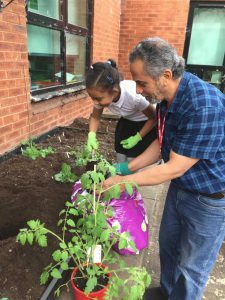 Our volunteer has been working with some of our children to help create a beautiful outdoor learning environment. 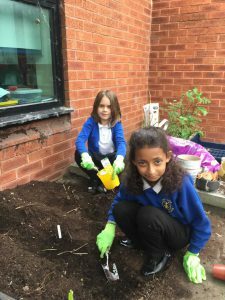 The children have planted potatoes, tomatoes, peas and cauliflowers. We are also focusing on plants which will attract wildlife into our Garden of Sanctuary.